Why Manufacturing Will Return to the U.S.
For more than a decade, deciding where to build a manufacturing plant to supply the world was simple for many companies. With its seemingly limitless supply of low-cost labor and an enormous, rapidly developing domestic market, an artificially low currency, and significant government incentives to attract foreign investment, China was the clear choice. Wage and benefit increases of 15 to 20 percent per year at the average Chinese factory will slash China’s labor-cost advantage over low-cost states in the U.S., from 55 percent today to 39 percent in 2015, when adjusted for the higher productivity of U.S. workers. Because labor accounts for a small portion of a product’s manufacturing costs, the savings gained from outsourcing to China will drop to single digits for many products. For many goods, when transportation, duties, supply chain risks, industrial real estate, and other costs are fully accounted for, the cost savings of manufacturing in China rather than in some U.S. states will become minimal within the next five years. Automation and other measures to improve productivity in China won’t be enough to preserve the country’s cost advantage. Indeed, they will undercut the primary attraction of outsourcing to China—access to low-cost labor. Given rising income levels in China and the rest of developing Asia, demand for goods in the region will increase rapidly. Multinational companies are likely to devote more of their capacity in China to serving the domestic Chinese as well as the larger Asian market, and to bring some production work for the North American market back to the U.S.
Manufacturing of some goods will shift from China to nations with lower labor costs, such as Vietnam, Indonesia, and Mexico. But these nations’ ability to absorb the higher-end manufacturing that would otherwise go to China will be limited by inadequate infrastructure, skilled workers, scale, and domestic supply networks, as well as by political and intellectual-property risks. Low worker productivity, corruption, and the risk to personal safety are added concerns in some countries. This reallocation of global manufacturing is in its very early phases. It will vary dramatically from industry to industry, depending on labor content, transportation costs, China’s competitive strengths, and the strategic needs of individual companies. But we believe that it will become more pronounced over the next five years, especially as companies face decisions about where to add future capacity. While China will remain an important manufacturing platform for Asia and Europe, the U.S. will become increasingly attractive for the production of many goods sold to consumers in North America. This report, the first in a series, examines the economic trends that point to a U.S. manufacturing renaissance. It also explores the strategic implications of the shifting cost equation for companies engaged in global sourcing. It’s becoming downright American to make stuff in America. Small manufacturers, craftsmen and retailers are marketing the Made-in-USA tag to score do-gooder points with consumers for employing stateside, says Margarita Mendoza, founder of the Made in America Movement, a lobbying organization for small manufacturers. It’s working: Over 80% of Americans are willing to pay more for Made-in-USA products, 93% of whom say it’s because they want to keep jobs in the USA, according to a survey released in November by Boston Consulting Group. In ultra-partisan times, it’s one of the few issues both Democrats and Republicans agree on. When considering similar products made in the U.S. vs. China, the average American is willing to pay up to 60% more for U.S.-made wooden baby toys, 30% more for U.S.-made mobile phones and 19% more for U.S.-made gas ranges, the survey says. “Regardless if this is a PR ploy or not, it doesn’t matter. A lot more people will look for the Made-in-USA tag,” she says, adding that, considering Wal-Mart’s size, $5 billion a year is only “a drop in the bucket,” for the retailer whose 2012 sales reached almost $444 billion. Kyle Rancourt says his American-made shoe company, Rancourt & Co., hit it big as concern over U.S. jobs mounted when the recession hit in 2009. But he says he lies awake at night worrying if Made-in-USA is just a passing fad. Mendoza says that if buying American turns out to be a passing fad, the country is in trouble. 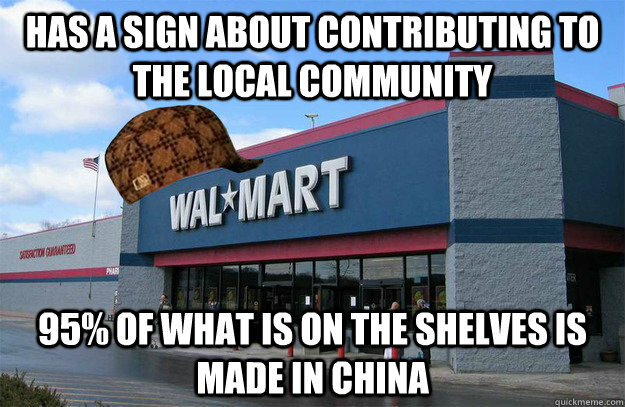 But do folks care enough about U.S. manufacturing jobs to permanently change the way they shop? David Aaker, vice chairman of brand consulting firm Prophet, says the companies that get the most credit for being American, such as Apple and Cisco, don’t even source products in the U.S. But Rancourt says his customers believe foreign-made shoes lack the soul of their American counterparts. China Riots Send Manufacturers Packing? China has long been a desired destination among the world’s biggest multinationals looking to fill labor-intensive positions on the cheap. But recent riots there may have some foreign manufacturers thinking about moving production closer to home. From Apple’s (NASDAQ:AAPL) biggest iPhone manufacturer, Foxconn, which employs tens of thousands of people in China, to Toyota (NYSE:TM) and Caterpillar (NYSE:CAT), manufacturers have long taken advantage of China’s low-cost labor, solid infrastructure and softer regulations. But calls for better wages and working conditions have been growing louder in China over the last decade, recently exploding in a 2,000-person fight at Foxconn just days after the new iPhone 5 began selling in the U.S.
And after years of relative peacefulness, disputes between China and Japan ramped up earlier this month, showing once again that China is not immune to social and economic strife. The recent socioeconomic problems in China come as the government undergoes a once-a-decade transition, which has brought political upheaval and distracted the incoming Communist Party. The two-week disappearing act by China’s president-in-waiting Xi Jinping earlier this month and doubts over the accuracy of the country’s economic data have also highlighted the uncertainty that comes when companies conduct business in China. Manufacturers may not have reached their tipping point yet, but the latest news out of the region, coupled with ongoing labor issues and rising wages, is further chipping away at their confidence. “The combination of increased costs and unrest of labor force at some point will shift the collective wisdom,” Meyer said. Chesapeake Bay Candle’s U.S. factory in Glen Burnie, Maryland. Chesapeake Bay Candle never thought twice about offshoring its manufacturing when the company started 17 years ago. To make the product it wanted, each candle had to be handmade, and there was no cost effective way to do that in the United States. Four years ago, however, the company reversed that thinking, centering its operations domestically, and betting that as the global economy changes, the move will actually save it money. Chesapeake Bay, with a factory in Glen Burnie, Md., is hardly alone in rethinking its manufacturing plans these days. More and more American firms are bringing those operations home — and while it might be a little premature to call this “re-shoring” effort a movement, it’s certainly starting to become a trend. President Barack Obama, in his State of the Union speech, noted that American manufacturers created new jobs in 2011 for the first time since the late 1990s. In a recent survey by MFG.com, an online marketplace that helps businesses find manufacturers for their products, 40 percent of the manufacturing firms it polled said they had benefited from work that had previously been sourced to a supplier in another country. MFG isn’t the only study that has pointed to an increase in re-shoring. A survey by the Boston Consulting Group in February found more than one-third of U.S.-based manufacturing executives at companies with sales greater than $1 billion are either planning or considering bringing production back to the United States from China. Speed to market is becoming more critical, as companies keep lower inventories. For Chesapeake Bay, it was less a matter of customization as it was cost control. The candle company originally based its manufacturing in China, but as anti-dumping laws (designed to prevent predatory pricing) began to impact duty rates, Chesapeake Bay took its operations to Mexico. Unhappy with the manufacturing ecosystem there, it tried a few other countries, eventually landing in Vietnam in 2000 — a popular manufacturing hub for companies. Labor costs, however, are on the rise in countries like China and Vietnam. BCG says wages in China are currently climbing at 15 to 20 percent per year, due to the demand for skilled labor. The group expects net labor costs for China and the U.S. to converge in the next three years. Xu notes that Vietnam closely follows China’s lead on issues like salary and benefits. Today, the average salary for a manufacturing employee in the country is between $300 and $400 per month. That’s still well below the $12.50 to $13 per hour employees in the United States can earn, but salaries only make up 20 to 30 percent of a product’s total cost according to BCG. Other factors, meanwhile, such as shipping are seeing prices increase as well, due to rising oil prices. Xu says Chesapeake Bay noticed some shipping companies cutting back their overseas routes as well, which threatened the company’s turnaround time. That speed to market is more critical today than ever as companies keep lower inventories on hand as a precautionary measure. Meanwhile, advances in technology domestically have made it easier to be competitive with overseas companies. For The Packaging Team, the degree of that competitiveness varies by product and order size, but the savings comes from new equipment Brandel says increases the speed of sealing packages ten-fold. There are risks to re-shoring, too. Xu says Chesapeake (which has since transitioned to machine-filled candles) spent $5 million to secure a large factory in Maryland when it moved manufacturing here. That plant spans 125,000 square feet and can produce up to 2,000 candles per hour. But right now, it’s not being used to capacity. The ability to ship product in two weeks versus six or seven is certainly beneficial, but there are overhead concerns. Xu notes that she remains optimistic, though. The number of people required on the manufacturing line is significantly lower in the U.S., which helps lower costs, she says. Right now, the cost to make a candle in the U.S. is approximately the same as it is to make one in Vietnam, but Chesapeake says its betting it will see notable savings in the future, given the rising salary trends and fuel prices. Despite what many people might think, capitalizing on the “Made in USA” movement is less of an incentive for many companies. Even U.S. consumers don’t seem to be as passionate about it as many claim — though, ironically, there’s a notable demand for U.S.-made products in overseas markets — including China. Much of Element Electronics’ factory in Canton, a suburb west of Detroit, is empty. But on a single production line, about 45 workers are assembling the first televisions made in the US by an American company in decades. So far, it is a small operation, but Element’s attempt to bring TV manufacturing back from Asia to the heart of America’s rust belt is a powerful example of reshoring, the trend of jobs once outsourced to low-cost emerging economies being brought back to the US. Reshoring is causing great excitement in the US. Companies such as General Electric and Caterpillar have been touted as high-profile examples of the trend. 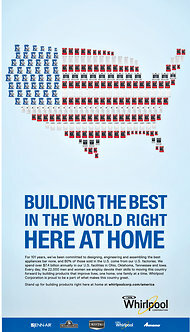 Since 2009 GE has announced plans to create 11,000 manufacturing jobs. In an election year, reshoring has also become a potent political symbol, a counterweight to those who say the US is in decline or that current economic policies are not working.